Sushi is perhaps the most famous Japanese food in the world. The most well-known sushi is the oval-shaped sushi, called nigirizushi which means hand-pressed sushi. Nigirizushi can be made with various toppings and is commonly served in sushi restaurants. Sushi chefs in Japan go through extensive training to learn to make nigirizushi. Nigirizushi involves a slice of raw fish atop an oblong, compacted mound of rice. 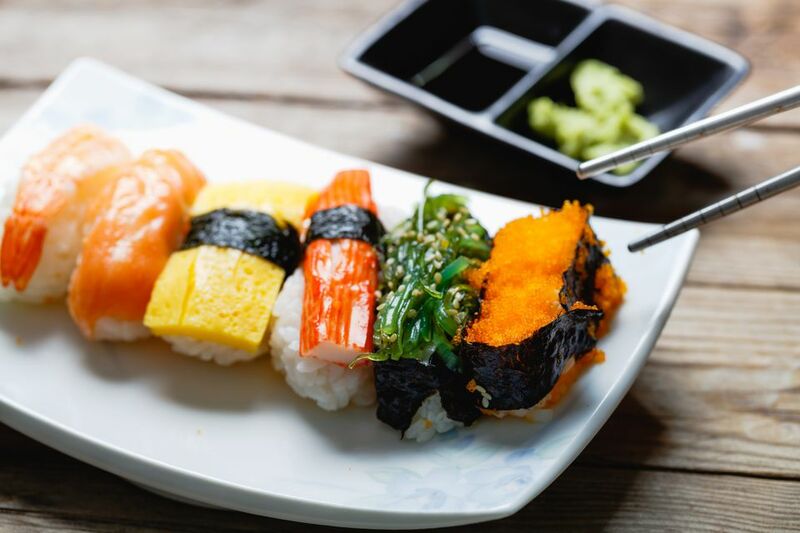 Nigiri is generally served in pairs, with a little dab of wasabi between the rice and the fish, and sometimes with a small strip of nori (seaweed) belting it all together. As the taste of sushi depends on how well the rice is cooked, it's important to make the rice properly. People become regulars to a sushi bar because the taste of sushi rice is suitable for them. Add vinegar mixture to steamed rice when the rice is still hot. Cool the rice quickly using a fan so that it will look shiny. Use a rice spatula to mix the rice, using a cut and fold motion so that you don't smash the rice grains. To eat nigirizushi, clean your hands at first and pick up a piece of sushi with your fingers. Then, dip the topping side in soy sauce to eat. Please be careful not to dip rice in soy sauce too much. Maki-zushi involves strips of fish and vegetable laid in rice and rolled inside nori to make a long cylinder. It's then typically served cut into 6 to 8 pieces. Another common find that's in the maki family is temaki, which translates literally as "hand roll" (the term often used Stateside). Temaki involves a nori cone which holds the fish, rice and other ingredients inside. Then there's also uramaki, which is the "inside-out" roll with fish in the center, then nori and finally the sushi rice as the outer layer. These are, like the regular maki, created as long cylinders then sliced. Inari-zushi is encased in a pouch of fried tofu, and typically has no fish, only sushi rice. Chirashi-zushi is simply a bowl of sushi rice with the fish and other ingredients mixed in. The word sushi, when given a prefix, undergoes consonant mutation to become zushi, which you can look at as just a different way of "voicing" the s. Consonant mutation happens in many languages; in Japanese, this particular phenomenon is termed rendaku.